How Many Times a Week Should I Be Doing Pilates? Every week we get asked this question at least once, it’s a popular and a great question! Now, if I was all about the money 🤑🤑🤑 then I would be telling you to do Pilates every day, every damn day, and to only do Pilates with an instructor and never at home alone. But I’m not, and as much as I would love to see your face in my classes every day, ain't no-body got $$$ 💰💰 for that! And, you can absolutely do Pilates at home on your own without an instructor! So here’s the deal on how many times a week you should do Pilates and how you can add in some extra sessions to your schedule. What Did Joseph Pilates Recommend? Joe was renowned for saying “In 10 sessions you'll feel the difference, in 20 sessions you'll see the difference, and in 30 sessions you'll have a whole new body". he also followed this by recommending you do Pilates 3-4 times a week. When Joseph created Pilates he also published a book “Return to Life” and in this were photos and instructions of how to do each of the mat exercises with the intention that you do these exercises at home. He was all about enabling people to do Pilates on their own at home because he knew that if you did it regularly you would most certainly notice the difference. What Does Current Evidence Suggest? The Australian Government Department of Health currently recommends that adults do muscle-strengthening activities at least twice a week. (you can see the guidelines here) Sooo, Joe was pretty close to the current evidence! We are big believers that everyone has to start somewhere and that what works for one person won't necessarily work for the next. So we usually say, if you are doing a Class once a week, then you are off to a great start and better off than you would be if you were doing nothing at all. Our clients who attend regular classes two-three times a week, definitely comment on the significant changes they see in their bodies, like strength and flexibility and the ways that Pilates is making a difference to their everyday lives, physically and mentally. They also see a greater improvement in their Pilates ability over a shorter period of time, in comparison to those who attend once a week. How Can I add in Extra Sessions To My Schedule without Breaking the Bank? We understand that each person is different; we all have different goals, different incomes, different commitments and different things going on in our lives. So suggesting to each person that they attend Pilates classes 2-3 times is not always realistic. What exercises can I add into my daily practice? Use our March Matness videos on Instagram to help get you started - pick the first 5 or 6 exercises and use these as your self-practice. There are variations on most of the posts, so if you find that an exercise is too difficult for you at the beginning, use the variation to slowly build it up! For just $5 USD a week you get access to a 30 minute Mat Pilates Workout that you can do as many times as you like for that week. Then the following week a new workout is released. Sooo convenient and sooo cheap!!!! Why Workout At Home Too? The best part about working out at home is that you can do it at any time that suits you. It is also a fantastic accompaniment to your regular in-studio Pilates class each week. Working out at home allows you to get in that second or third session that you haven’t been able to factor into your budget or your schedule and trust us - it will make you feel great - physically and mentally. But if you’re worried that your technique on a particular exercise in your home routine isn't quite right or up to scratch - pop into class 5 mins early and check with your instructor! We would be so happy to help you and would love to hear all about your home practice and how it is working for you. Alternatively, if you think that you are able to work that second or even third class into your life - let us know and we can help you find an extra class! Or you can click here and check out our timetable. We would love to know what exercises you end up choosing for your Home Practice. If you need some help staying accountable then let us know and we can make sure you are getting your sessions done! So You Want a Strong Core… BUT Do You Know Why? How do I strengthen my core? What is the best exercise for my core? Why should I strengthen my core? Can a weak core cause back pain? If so, I am sure that you were bombarded by blog posts and articles ranting and raving about the importance of a “strong core”. And, as is to be expected with an extended amount of “Dr Googling”, you were probably left confused and maybe even convinced that You “have no Core!” or that strengthening your core would be the answer to all of your problems. So Let's Break This Topic Down, What Is This Core Thing And Does It Even Matter? The “Core” Is a term often used by people to describe the centre of their body and most people associate this with their abdominals, back muscles and pelvic floor. Originally, we taught people to squeeze and contract all of these muscles at once, thinking it would help them be “stable” and would get rid of their back pain. But more recent research suggests that it isn’t all about your abdominals, and that having weak abdominals doesn’t necessarily mean you will have back pain. The thought process on how we should engage these muscles has also changed. Whilst it can be important for certain people to engage and cue their pelvic floor and whilst we know that it is important to be strong throughout our body, we also now know that we don’t have to be squeezing these muscles all of the time. Muscles are meant to contract and relax to produce or control a movement or body part. Our muscles and our bodies adapt and produce more or less force depending on the demands of a task, rather than producing a large force all the time. If we were to squeeze everything all at once, all of the time or even to perform a task, our body would become rigid; movement would become more difficult to produce and tasks like bending over or twisting, would be much more difficult to perform. If I don’t need to squeeze everything at the same time and having super strong abs isn’t the answer to my problem then what am I meant to do? You are meant to Move! Your body is meant to be able to move in all planes of movement. Your spine is meant to bend, extend and rotate with control and strength! Find an activity you love, a way of moving your body that makes you happy and do that! Get yourself and your body strong and resilient, so that you can perform the tasks that you love and need to do daily, with ease. Do all of this and you will be laughing! -To move through all planes of movement. Want to fall in love with moving your body again? Don’t let MenoPAUSE put a stop to living your life! The benefits of physical activity during menopause. It’s the M word every woman dreads. Menopause. Whether you’ve experienced it or not every woman has heard about this period of life, whether it be from their mother, sister, grandmother or even movies and social media. It’s commonly portrayed as the evil step sister to the reproductive period of our lives, characterised by stories of hot flushes, night sweats, fatigue and headaches. And with all these symptoms the last thing you probably want to do is be active right? Why becoming or remaining active during this time in your life should be a priority. BUT, participating in weight bearing and strength exercise during this time can have great effects on strengthening and maintaining bone health. Not only this, strength exercise has also been linked to increased muscle mass, weight management and a reduced risk of falls later in life. Changes in hormones, along with lack of activity due to menopausal symptoms can also result in weight gain, particularly in the abdominal region. Increased abdominal or visceral fat increases a person’s risk of developing many forms of chronic disease including: heart disease, type II diabetes, stroke, high blood pressure and some cancers. Exercise can have a powerful effect on managing not only weight, but all these risk factors through improving heart and vascular health along with increasing insulin sensitivity and regulating blood glucose levels. As hormone levels continue to decline, there are also a number of changes that occur in the genital region. These can include thinning and reduced elasticity of the vaginal wall along with atrophy of the pelvic floor muscles. This can lead to continence concerns along with pelvic floor dysfunction. Gentle exercise targeted at strengthening the pelvic floor muscles, such as Pilates, can therefore have a positive impact on not only reducing incontinence but also the stress and anxiety that can occur with such conditions. Ready to tame the menopausal beast? Just a little activity everyday (at least 30 minutes) can assist with the management of menopausal symptoms and help YOU live the happiest and healthiest life YOU deserve. Not only for yourself but also for your family, partner and friends! This month we spoke with Raelene. Raelene is a HQer through and through, and has been coming to our classes from the Start, back when there were only four reformers in Steph's Home Studio. Raelene is well and truly part of the HQ Tribe and not only has her strength and control improved in leaps and bounds but she has also managed to rope her husband into starting (and loving) Pilates. 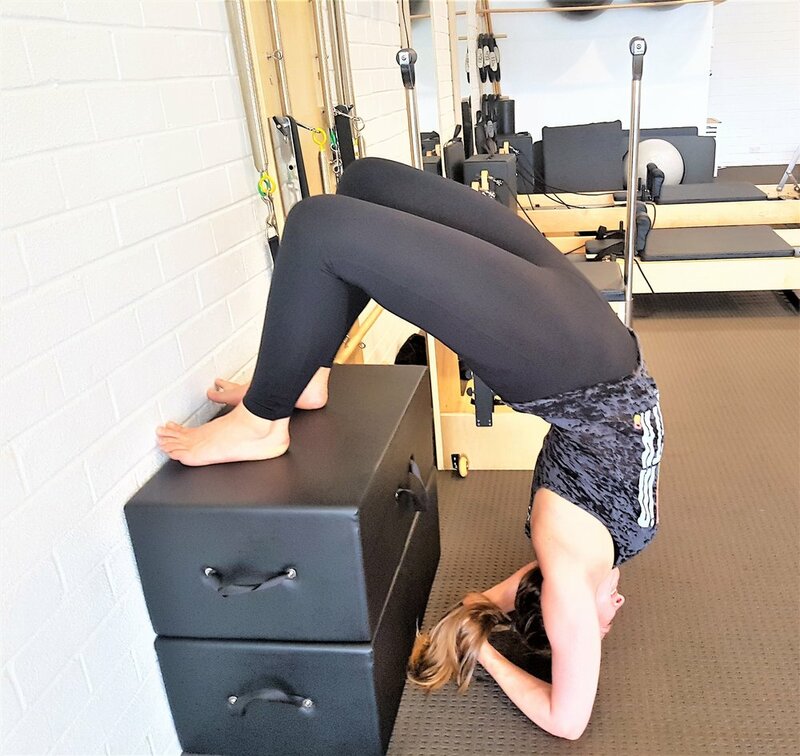 Read on to find out all about Raelene's Pilates Journey. 1. What enticed you to come to a Pilates class? I have suffered a couple of injuries which have ongoing impacts. I was finding boot camp and running too hard on my body, my Physio (not Steph) had told me to stop all sports. I did for a short-term but being active all my life was hard so I had to find an activity that would allow me to find a happy medium in my life that would keep me active and build strength without the hard impact on my body. 2. Were you feeling nervous or anxious about your first class and why? My feelings were more around hoping that I could do some of the exercises and I was fit enough to get through the session. 3. What is your favourite Pilates exercise and why? I have two –Teaser and Legs in strap bring legs up overhead (Don’t know the name). Both of these exercises I felt I could get quite quickly, whereas other people struggle. But I then love the fact there are days when you think you have nailed it but can barely get your legs into table top always a challenge. 4. Which exercise is your least favourite and why? Back Bends- Body just not as flexible as it used to be. 5. What makes you excited either; creatively, mentally or physically about the Pilates method? I love the fact that no two classes are the same and every class challenges you in many different ways either being able to do the physical exercise or your mindset of having your feet high on the bar or balancing. Even the days when you don’t feel up to going you walk out 45 minutes later feeling good. I actually hate missing a class and get a bit annoyed if something interferes with my schedule. 6. What has kept you interested in Pilates and why do you keep coming back to class each week? That no two classes are the same, there are days when you can nail the difficult exercise and then there are days when you can barely get your legs into tabletop. I have been able to go back and play my basketball and netball as well as Pilates and I believe due to the fact it is continuing to keep me strong and reasonably fit but low impact on my body. 7. What improvements have you noticed since coming along to Pilates Classes regularly? Both my upper body strength has improved and also with my injuries, I do not suffer as much pain as I have been able to strengthen my body without the impact. 8. Do you have any advice to give someone that is thinking about starting Pilates? Whilst it may not be for everyone it is the old saying you will never know unless you give it a go. It's our favourite time of the month again! This month, we spoke with Tabetha Pearce. Anyone who has met Tabetha in class will attest to the fact that she is a pilates machine! she is strong,flexible, determined and dedicated, and the energy that she brings to a class and the studio is incredible! 1. What sort of Exercise/Fitness Training have you done in the past? In my younger years, I dabbled in many sports including swimming, tennis, netball and basketball. In the last decade I have enjoyed cycling, CrossFit and hiking. I love to challenge myself, be active and have a bit fun. 2. What does your weekly exercise routine look like at the moment? I attend three Pilates sessions a week. If I have time, I aim to complete at least 6kms on my indoor rower before or after the Pilates class. 3. Why did you decide to start Pilates? For over six years, I worked out at least four times a week at CrossFit. I made great gains with strength and endurance, however I began to experience recurring issues that required ongoing physio and chiro treatments. I began Pilates to improve my mobility, flexibility, and more importantly, to target my core and smaller muscle groups. I started my Pilates journey 18 months ago and haven’t looked back. Steph and the Pilates HQ team have provided assistance and guidance, helping me focus on correct technique to retrain my body to operate optimally. 4. What have you most enjoyed about Pilates? The HQ team provide a varied, challenging and fun program. If I can’t complete a movement or I require a little bit more of a challenge, they are more than happy to adjust the activity to suit. I love that Pilates is for any age, gender and ability. My 15 year old daughter has added Pilates to her own weekly fitness regime. It is extremely important to me that she learn to love her body and see what it can achieve. Her body confidence and awareness has increased through this a safe, low impact method, suited to her growing body. It’s also the perfect excuse for mother/daughter time! 5. Have you noticed any benefits or improvements in your other exercise/fitness activities from doing Pilates? Absolutely! Pilates has played a part in me coping with long days of work and study, hunched over a computer or desk for hours at a time. Pilates has also increased my body awareness, to better control and isolate those smaller muscles. 12 months ago, I struggled completing a 2km indoor row without experiencing some level of lower back discomfort. I can now row over 12km without any pain or discomfort. 6. You attend three Pilates classes a week. Did you notice any differences or changes when you increased from 2 to 3 classes a week? I found the extra class was a gentle, safe yet still challenging way to increase intensity without the extra stress on my joints or ligaments. 7. What keeps you coming back to Pilates classes each week? I want to be better than yesterday! I want to achieve that movement that I struggled with last class. Walking through the Pilates HQ door is always a pleasure, knowing that you will receive a friendly welcome. The Pilates HQ team are very supportive and encouraging. Always focusing on technique and tailoring a class to an individual’s needs and ability, which makes every class challenging. 8. Do you have any hot tips or advice for anyone that is just starting on their Pilates Journey? It doesn’t matter your fitness background, ability or age; Pilates has something for everyone! It is amazing for rehabilitating injuries, keeping aches and pains at bay and staying supple and agile. I recommend Pilates as a fantastic way to compliment any sport or fitness activities to improve your functionality and performance. How to Conquer your Group Exercise Anxiety. And Yes, it is a Real Thing! You all know the feeling… that deep in your gut, stomach flipping feeling you get when you even think about joining a new gym or exercise class. Thoughts start to creep in like; “I’m not fit enough”, “people will judge me”, “I could never use that equipment”, “I’m overweight”, “I’m too skinny”, I’m not strong enough” “I’m not flexible enough”. Starting something new can be scary and daunting; a new environment, new people, challenging exercises, and the fear of looking silly. But having these feelings and thoughts are completely normal. We can guarantee that nearly everyone attending that class/gym with you, has been in your head space at some point and has had these exact thoughts. We can’t necessarily stop all of this from happening, but, what we can do is give you some suggestions of how you can lessen the nerves associated with attending your first Pilates Class… or whatever it may be! Why not exercise together? Having a buddy in class with you, can put you at ease knowing you are not alone in a new environment! Someone to giggle with and go out for coffee with when you’re done! PLUS, they also help hold you accountable – if they go, you have to go! Why not try a 1 on 1 session first? This will give you the opportunity to get the hang of the exercises and machines, without feeling the pressure of anyone else watching you while you are learning.Feeling nervous about having other people watching you in the class or not knowing how to do the exercises is perfectly normal. Remember: everyone has to start at the beginning! Believe in yourself, We do! You are your only competition - You don't need to compare yourself to others, worry about whether you will be as good as others, about what you’re wearing, because we don’t! You are amazing! If you have a goal, stick to it and don’t let that fear of what other people will think, or doubt in your own ability creep in. Focus on yourself! You are there for You, so take the class at your own pace and do what feels right for you and your body! We would love to talk to you! Maybe even organise a time to come and see the Studio, we love meeting knew people and strive to make your time in our studio as amazing as possible. Any questions you have are more than welcome so please, shoot us an email or a phone call and we will set you on the right path. So why not strike while the iron is hot, check out our timetable and send us an email with your burning questions or with a request for a 1 on 1 - we can’t wait to hear from you. Steph & The Pilates HQ Team! P.S YOU’VE GOT THIS! - YOU ARE A MOTHER FLIPPIN GODDESS!